Nice detached house in a quiet location at the edge of a little village in the Dordogne. You can enjoy a beautiful view of a valley from the partially covered terrace in front of the house. This is a great place to spend time both in the morning (with the sunrise) and in the evening! The house has 3 spacious bedrooms and is equipped with all the conveniences. The bathroom, kitchen and living room were renovated in 2007 and boast a luxurious design. The large garden provides plenty of space for playing and relaxing; next to the swimming pool you will even find a lovely bar with a refrigerator, a wonderful spot to read a book or enjoy a nice drink together. 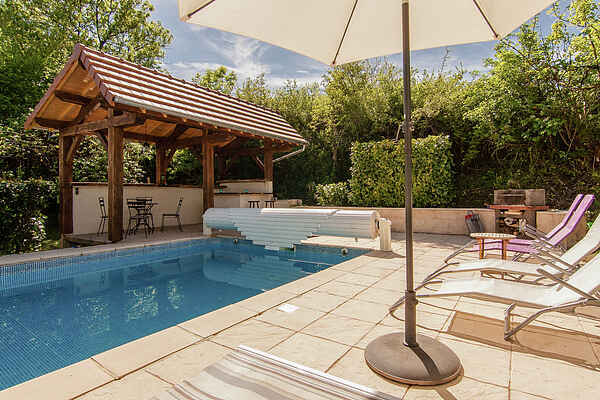 The heated private pool was built new in 2008 and is in excellent condition. The shallow end has Roman steps, 4 semi-circular steps that you can walk down to enter the pool. The pool is 80 cm deep at the shallow end, deepening to 1.7 metres at the opposite end. The area surrounding the pool is tiled and there is a large terrace (30 m2) on one side. You can take all sorts of nice daytrips from the house. You will find detailed information about this in the house itself.